It is still unusually hot & summer-like here in Minneapolis. Typical temperatures this time of year are high 60's & we have been in the mid 80's. It's a good thing for the crops as the cold spring gave everything a late start & many things are ripening late. Tomatoes & sweet corn are two things that came in late this year but are now at their peak & star together in this wonderful main dish salad. Sweet corn is best right now when its had plenty of time to build up the sugars & really live up to its name. Oh & the tomatoes! The two heirlooms from our CSA box couldn't have been more perfectly flavored & textured. The bacon adds a good saltiness to the salad while the fresh jalapeno gives a pleasant heat. The dressing is fantastic, we especially liked the tang of the goat cheese against the sweet corn. Matt was tempted to replace the goat cheese with gorgonzola, which would have been good as well, but we liked the way the goat cheese didn't overpower the other flavors. The original recipe had to hollow out the tomatoes & serve the corn salad inside which I'm sure would be a pretty presentation. Our heirlooms weren't super pretty for that type of serving so we just sliced them up & placed them on the plate. Plus I think its easier to eat this way. While the corn mixture is cooking, mix the buttermilk & goat cheese together until smooth (a small food processor works well for this). Stir the cooked corn mixture into the dressing. Stir in the scallions & season with salt & pepper. Divide the tomato slices between two plates. Spoon the corn & dressing over the top. Sprinkle with bacon. This salad made a very filling meal served with a side of rosemary flatbread. 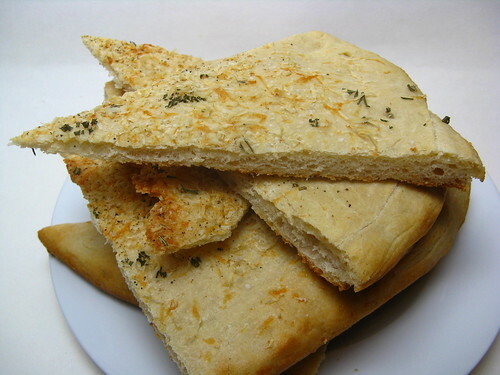 Matt made this flatbread by topping our favorite pizza dough with olive oil, salt, fresh rosemary & freshly grated parmesan, yum! A buttermilk and goat cheese dressing sounds heavenly! I love your presentation - the colors are so vibrant and each element is distinct. Our tomato plants are actually starting to poop out now; we planted early-growth varieties but I'm happy to hear that I'll still have a chance to enjoy others' late harvests! I love the creamy corn. This sounds like good ol' comfort food! I will have to forgive you for being a Michigan fan. My team is Notre Dame! Congrats on the win. what a delightful use for garden goods. i love the color and texture variation, and the little dash of buttermilk is brilliant! 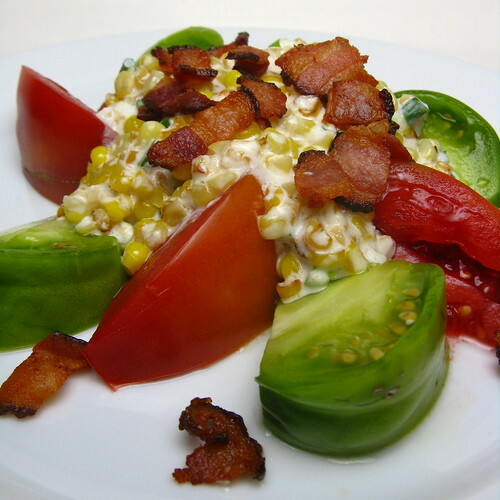 Sweet Corn and Tomatoes are in season here too... and Bacon makes everything taste better!!! Looks awesome!!! that sounds like an awesome salad. now i'm thinking about how i haven't made rosemary focaccia bread, and my rosemary plant is going to waste! Here in Wisconsin, our tomatoes are just starting to turn. We started plants from seed (late, of course) so I am hoping they all ripen before our first frost! This recipe is definitely a keeper...it sounds delicious! Now, if those tomatoes will only cooperate, lol. That salad looks SO good right now! I love the flavors it has going on. Oh I totally agree about the gorgonzola! That would make this just perfect for me. I think we have all the makings of this in our veg box this week. ... I have decided that this is tomorrow's dinner. I have bacon, I have corn, I just need some cheese and tomatoes! I made this for dinner tonight, and it was fabulous! My husband and I both loved it. On the side we had thick slices of homemade whole wheat bread (buttered, of course!). Yum!